Very non traditional, four custom design Easter Eggs are lined up in a row on black. 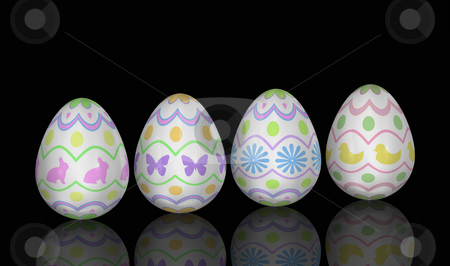 Each egg has a basic tiered design with changing elements of bunnies, butterflies, flowers, and baby chicks. Eggs reflect at bottom onto an imaginary surface. Eggs have subtle realistic texture and subtle reflective qualities.